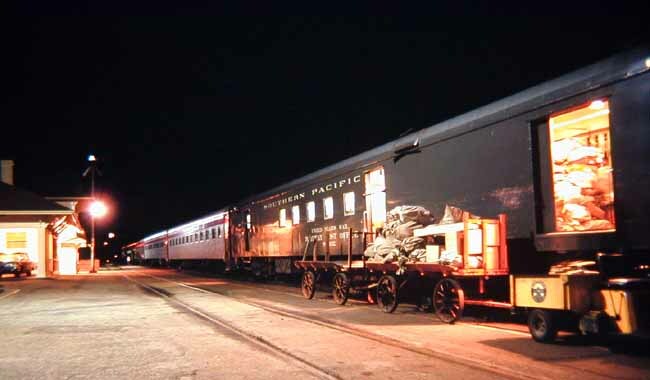 When I knew the Southern Pacific, back in the 1960s, it was on the cusp of leading the fight to discourage passenger travel. Its extensive fleets were becoming threadbare. Reserveration phones went unanswered (or trains were dishonestly reported as too full to take new travelers). 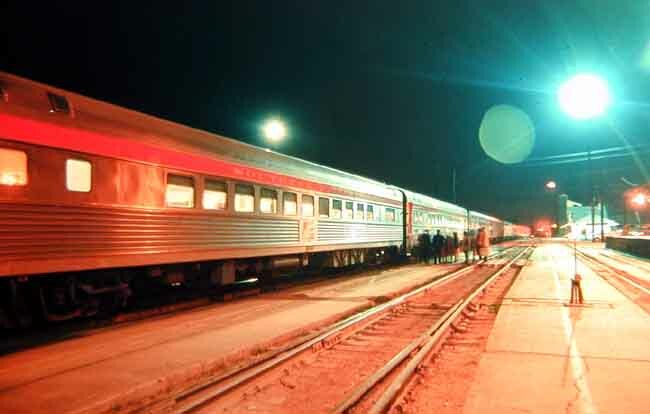 Its sections of cross-country runs, like the City of San Francisco, were becoming distinctly inferior to those of its partners, and it messed around with such customer unfriendly innovations as 'automatic buffet cars'. 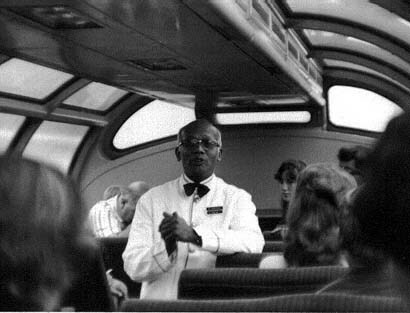 Indeed, on one of my trips on the City of San Francisco a disgruntled dining car steward showed me a letter from a railroad official reminding employees it was against company policy to encourage passenger travel. He was angry, and I couldn't blame him, because the railroad removed all the silverware from his diner, leaving his employees to purchase plastic knives and forks when we pulled into Sacramento. 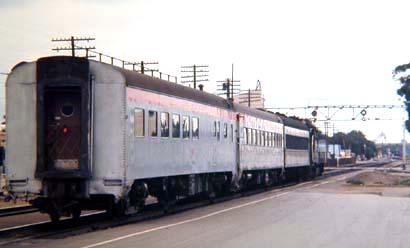 The normal consist for this train was as follows: Sleeping cars from Seattle (carried on connecting train to Portland) and Portland, chair cars, dining and lounge service and an automatic buffet car. Below is the Del Monte, photographed in Redwood City on the San Francisco Peninsula, on its way down to Monterey. and Pacific Grove. 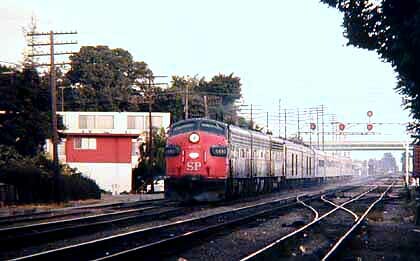 It carried coaches and a parlor snack lounge car, with reserved seats and, reportedly, SP's best bartender. 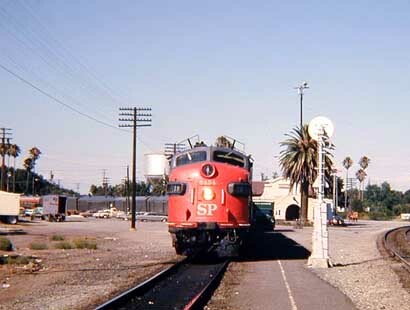 Here's the San Joaquin Daylight, near Tipton, in 1968. 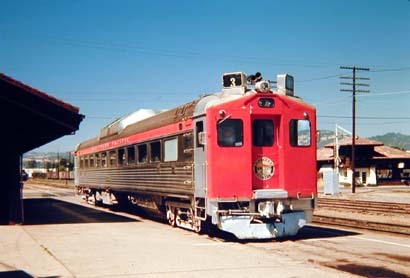 This train carried chair cars and an infamous automatic buffet from Oakland to Los Angeles. My Official Guide tells me SP charged an extra dollar for adults to make mandatory coach reservation. Below are shots of the Coast Daylight, taken in Redwood City in 1967, on its way from Los Angeles to San Francisco. 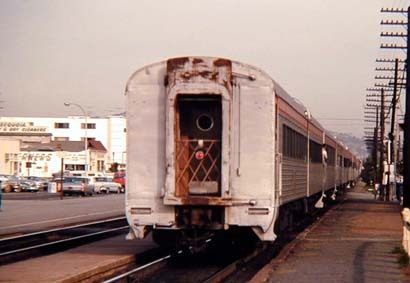 Depending on the season it carried a dome car and parlor until the late 60s, but, par for the SP course, an automatic buffet replaced its diner by mid-decade, causing a substantial customer outcry, particularly because the SP killed bar service as well and did not put beer in its vending machines, which reportedly ran out of supplies long before arrival. 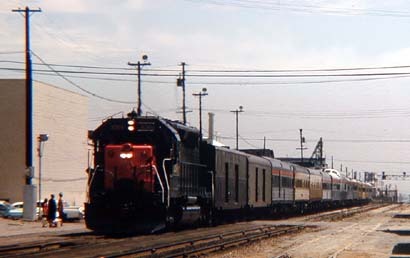 The next photo is of train 21 a single coach-express-mail train that shared the the Ogden - Oakland route with the City of San Francisco. The photo was taken in Wells, Nevada, in 1964. 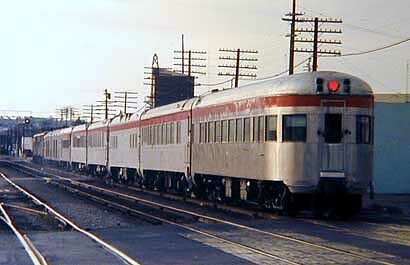 The next three photos are of the Lark, a premier overnight train connecting Los Angeles and San Francisco. 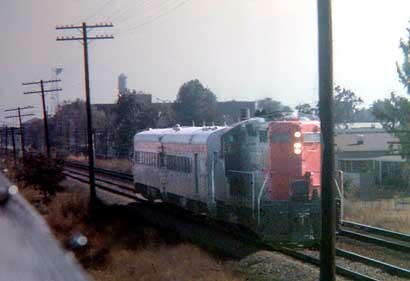 The first two are of the last Lark, photographed in Redwood City on April 8, 1968, on its way into San Francisco. 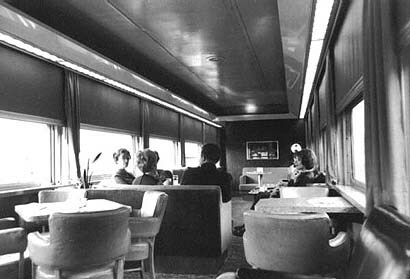 This always popular train carried a full lounge, sleepers, dining car and coaches. Business people could avoid problems associated with getting to LAX and fighting the 101 Bay Shore Freeway to get to meetings in San Francisco. The third photo is of the train's mail car, taking on Christmas Mail in Southern California, probably Ventura. 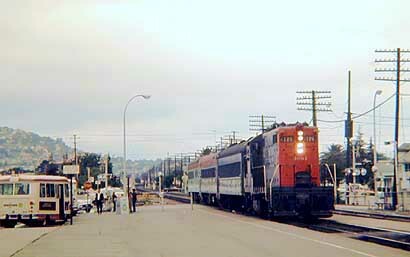 Below left is an inbound City of San Francisco/Overland at Berkeley in 1968. Run with the Union Pacific and Milwaukee Road, this train carried a dome lounge, dining car, lounge car, automatic buffet, sleepers and chair cars to and from Chicago and St. Louis. 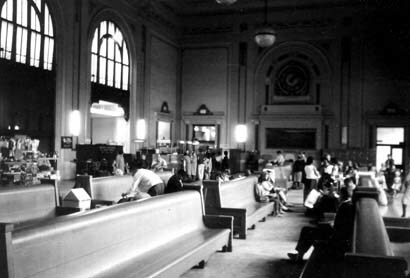 The photo next to it is of the Oakland Station, which once had direct ferry service to San Francisco and is now abandoned, and photos from my trips on the train, in 1966 and 1969. 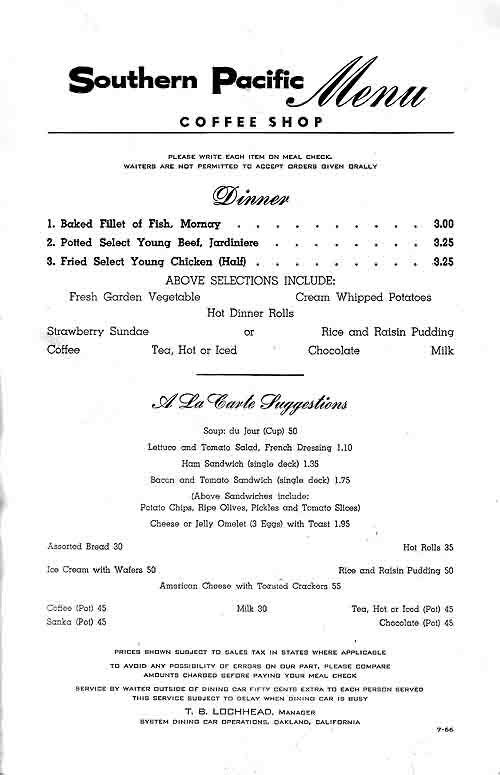 Click here to see the coffee shop menu from my 1966 trip. Note that this very skimpy menu, printed on cheap paper, was from the only sit down food service on a transcontinental train. 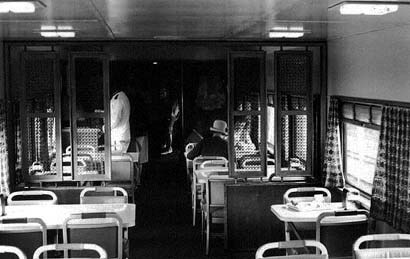 When we switched over to the Union Pacific portion of the trip there was a major improvement in what became a true dining car. 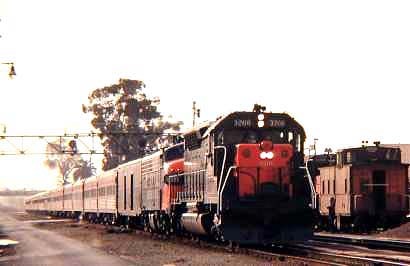 Above right is #19, a chair car only train from Portland to Oakland, photographed in Davis, California, in the mid-60s. 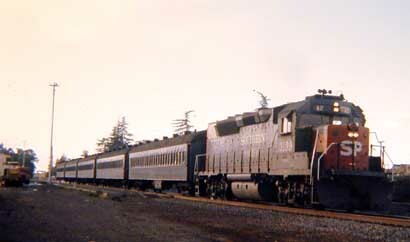 On the left Northwestern Pacific #3, sitting in Willits, from which it went up to Eure ka and back three days a week . 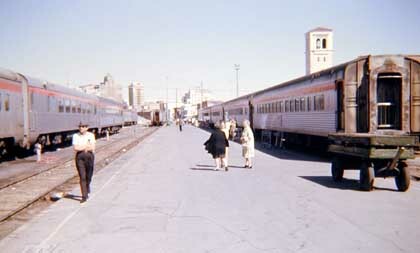 On the right, photographed from a dome on the California Zephyr, SP's Sacramento Daylight, a once daily train from Sacramento to Los Angeles. 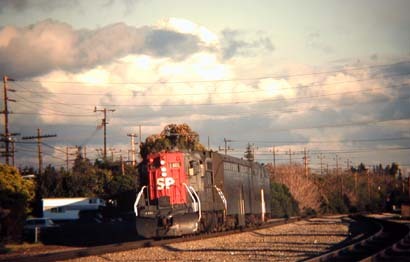 Here are photos of SP's Peninsula service trains, taken in Palo Alto. The first two photos below are of the Coast Daylight, taken near Santa Barbara in 1966. A business car brought up the rear. Below them are shots of the Sunset-Golden State, taken in Southern California. 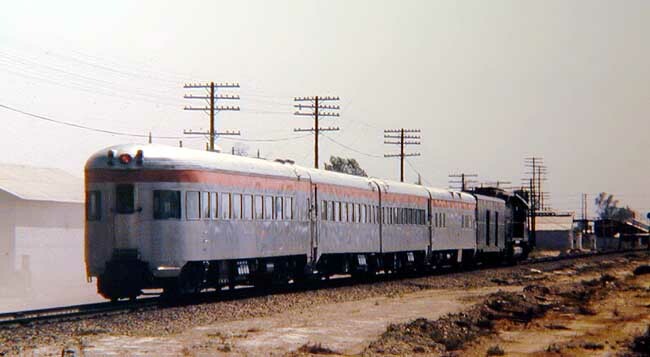 In the mid-60s this train, which was shared with the Rock Island, connected Los Angeles with Chicago, New Orleans, El Paso and Kansas City, carrying the usual array of of long-distance equipment. 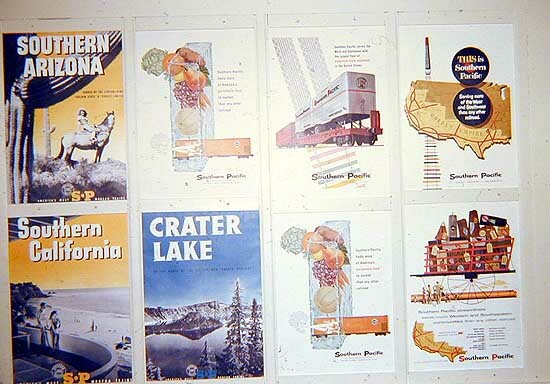 On the left is the Sunset-Golden State in El Paso, where the Chicago and New Orleans sections were split, and on the right some faded SP advertising in one of its stations. The Southern Pacific is long gone, absorbed into the Union Pacific. 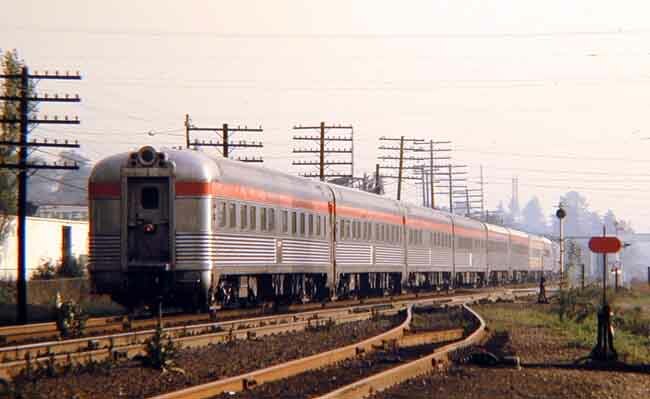 Though it took many years to happen, there has been a true renaissance in California passenger rail, what with an exploding set of services in and around Los Angeles and Santa Barbara and out to Sacramento from San Jose - Oakland - Emeryville and down the Sacramento Valley to Bakersfield. The Coast Starlight runs daily from Los Angeles up to Seattle and the Sunset Limited provides service (albeit not daily) to New Orleans and Orlando. There is now planning underway for high speed service between Los Angeles and San Francisco, and much of the Peninsula right of way is being rebuilt. Though public attitudes in California favor increased rail of all kinds, private interests, including the UP, still throw up roadblocks wherever they can.